This week I’ve started animating a small scene revolving around a space exploration rover, making its way across the surface of another planet. It originally started out as a few doodles and an idea about making a clockwork spider. While I did end up building a spider character from this, it was another character model that I was intrigued by and tried animating with. Following the first shot, I drew up this storyboard in order to help me plan out what to do with the rest of animation. I want to use the range of movements I built into the character, and hopefully capture the quality of stop motion movement in the movements of this character. 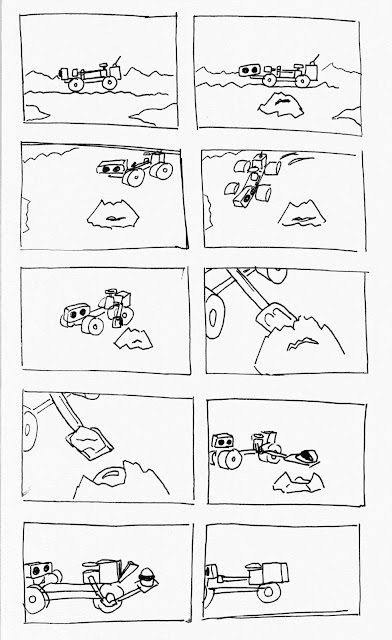 The short story presented here is mostly to show the curiosity of the rover character in a short amount of time. A lot of this will come from the pacing, giving enough pauses to emphasise the characters inner thoughts.